Neighborhoods have changed over the years. In the past, people brought baskets of sandwiches or fruit to the new people on the block. Sometimes they offered to help with a project. A welcome lady would stop by for coffee and leave a list of important numbers. Neighbors shared tools and garden equipment so everyone didn't have to go out and buy expensive items that they wouldn't use often. All neighborhoods have their own personalities. Some tend to be more open to street parties and socializing, while others are made up of people who prefer to stay to themselves. 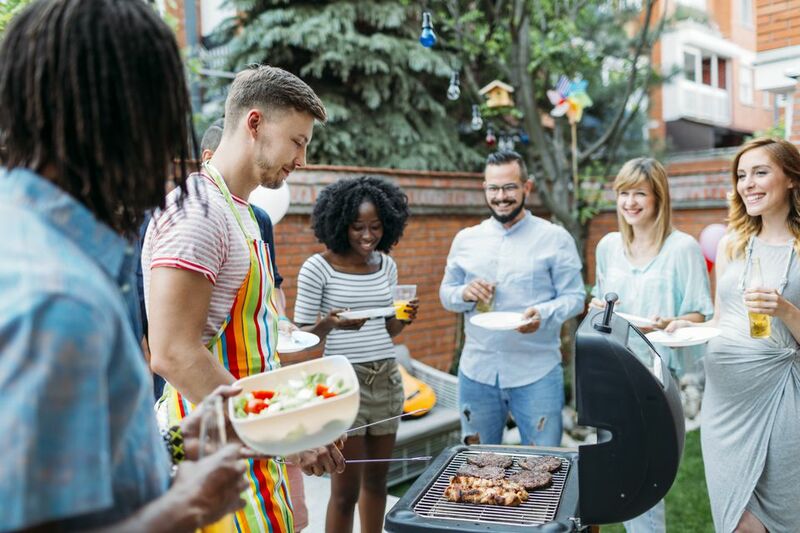 Regardless of the type of neighborhood you live in, there are still some basic etiquette rules you should follow to be a good neighbor. The ultimate goal is to live in peace and harmony, and even though that’s not always possible, you can at least do whatever it takes to prevent hostilities and long-lasting hard feelings. Follow these tips on how to be a good neighbor. If you live in an apartment building, don’t holler to someone at the other end of the hall. There is no reason to hammer a nail on a common wall that you share with the apartment next door past 8:00 at night. It can wait until the next day. Mowing the lawn at 7:00 on a Saturday morning will not endear you to your neighbors. Wait until at least 10:00 a.m.
Don’t honk your horn every time you pull into your driveway. Sitting outside on a warm summer night with your spouse or friend is wonderful, but if your house is on a small lot, and the neighbor’s bedroom window is close, it’s rude to hold a long conversation on the back porch past 10 p.m. Take it inside so your neighbor can sleep. Avoid all unnecessary noise from any source from 9 p.m. to 9 a.m. This includes revving car engines, children riding scooters, loud voices, and whatever else may wake someone from a sound sleep. Be mindful if you borrow anything. Return the item immediately after using it. If you break the item, pay to fix it or replace it. Don’t be the neighborhood gossip. If you have an issue with a neighbor, go directly to that person and discuss it in an adult manner. Don’t call the cops unless you are threatened. Not everyone is a dog or cat lover, so show responsibility for your pets. Keep them off the neighbor’s lawn and pick up after them. Remember your neighbors during the holidays with a card or small homemade gift and don't expect anything in return. Enjoy the act of giving. If you and a neighbor have a misunderstanding, make an extra effort to make things right by shaking hands and at least being on friendly terms. You don’t have to hang out. A simple wave as you pull into the driveway is sufficient. If your neighborhood has a homeowners association, know the rules and follow them. Remove mold from the exterior walls and paint when necessary. Make sure that trees, shrubs, and other elements don’t creep into your neighbor’s yard. This includes tree limbs, spreading shrubs, and weeds. Remove all bicycles, skateboards, and toys from the front yard at the end of the day. Ask your guests to park in the driveway or in front of your house. Make sure they don’t block someone else’s driveway or use another resident's designated spot in an apartment complex lot. Invite the neighbors to your big parties. Doing so shows friendliness on your part, and they'll have a much better feeling about you than if they weren't invited and had to listen to the sound of your guests having fun. Introduce yourself as soon as you can. Give the new neighbors your phone number. Hand-deliver a bouquet of fresh-cut flowers from your garden. Offer to have the new neighbors’ children over while the moving van is unloading the furniture. Give the new family a list of services and phone numbers in the area. Include emergency services, doctors’ offices, dentists, schools, places that offer carryout, dry cleaners, and whatever else you can think of. Have a block party once a year to get to know all the new neighbors. When people make an effort to be a good neighbor by following proper etiquette, everyone will have a sense of well-being, knowing you are all surrounded by friends. The neighborhood will be more appealing, and you’ll be more content in your home. An extra benefit is knowing that you and your neighbors will look out for each other and are available for help.